We take you to the mystic land of beautiful mountains, storming rivers across the steep valleys, paddy fields, Bhutanese culture and Buddhist traditions. As you travel, learn to make mesmeric images of the country’s traditional sculpture, steep mountains rolling north to south, ancient structures, welcoming people and the culture in a way that leaves a lasting impression. Dense forest and varying altitude that ranges from 300m above sea level to 7000+m above sea level has variety of species (680 species of Birds, 90 mammals and 5400 species of plants). 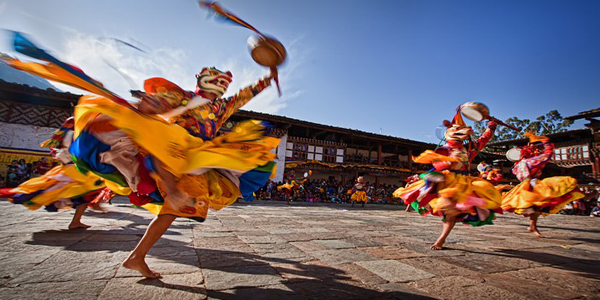 The festivals of Bhutan are one of the most memorable photographic experiences. Immense colour, drama and unique culture provide our guests with satisfaction and relaxation. This tour explores both the intensity of festivals and the peacefulness of the countryside. We will tour you to the festivals of Paro and Thimphu and will head east to Bumthang via Trongsa. We have left our guests to choose their own photographic package as per the number of days they want to spend in the country taking tremendous pictures. Please contact us for details or queries.